Styling And Superb Ride Qualities. ABS Disc Front Brake is the best possible brake any vehicle can have. Dual Supensions can make your ride as comfortable as it can be. Hydraulic ABS Antilock Disc Braking System: Given the performance potential of the engine and the handling prowess, you'd expect the brakes to be up to speed. And they are! With the front disc washing off speed easily and the rear drum strong and fade-free which allowing some pretty significant braking power. We are one of professional manufacturers in China specialized in research, manufacture and selling motorcycles, engines and spare parts. We strictly implement the ISO9001:2000 quality management system, ISO 14001:2004 environment management system, and the state CCC certification. 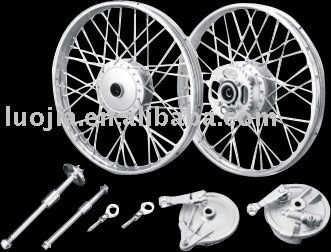 With 40 years experience in motorcycles manufacturing and cooperation with high quality HONDA C100-H technology, our products are both excellent in quality and reasonable in price. We offer a six months warranty on Motor and frame. Buyers are required basic repair skills such as using general tools; replacing nuts and bolts, filters, light bulbs, fluids, etc. The supplier is ranked number 11 by delivery data in Motorcycles & Scooters.